My Extruder Doesn't Work. What Can I Do? this is probably one of the most common cries of anguish heard from new RepRap owners. The picture on the right shows two common modes of extruder failure. In each case, the symptom is that the filament cannot be pushed through the extruder, or requires enough force to damage the filament even when the nozzle has been removed and the barrel is hot enough for molten plastic to dribble out of it. To find out what is going on, take the cooled extruder apart and look at the filament inside. If you can't get the filament out of the PTFE or PEEK spacer, the chances are that your spacer has got hot and the filament has bulged inside it. Use hose clamps or a metal sheath to stop the spacer from deforming. You will probably need a new one. If you see a blob of plastic sitting directly on top of the heater barrel, you have a gap. Any space between the top of the barrel and the end of the hole that it fits into will accumulate plastic. This plastic will not all be molten, and will cause a lot of friction on the filament as it enters the barrel. Typically the extruder will run for a while, but mysteriously clog up if you let it cool and restart it. Or it may just jam solid. The cure is to taper the top of the barrel to ensure it is driven into the PTFE or PEEK spacer, and to remove the thread from the top 1mm or so of the heater barrel. If the hole has not been tapped all the way to the end, this will let the heater barrel reach the bottom of it. It is important to clear any remaining melted filament before fitting the barrel back! While preparing the Mendel files, we’re all building prototype machines in the Bath Uni RepRap lab to get a mini factory up and running. 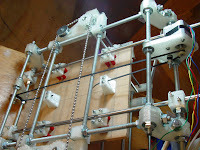 Whilst the other guys are building three standard issue Mendels, I’m going to scratch an itch I’ve had for a long time: it’s that "how big can this thing go", itch ;-) My single motivation is to have a large enough build volume to manufacture all of the printed parts in one single shot. This, in my mind, makes for a much more independent self-manufacturing machine. I laid up what a single shot build might look like and found the area for printing all the parts, with enough spare room for evolutions, to be 440mm square (marked with a blue line in pic below). That’s 5 times bigger than the standard Mendel build area. I’m going for a build area of 350 mm x 550 mm. Whilst this achieves the same area as 440mm square, it yields a more manageable footprint out of the Mendel architecture and caters for the fact that most print jobs are rectangular, not square. I modelled the variant design (I’ve dubbed it Mendel Apollo after the 440 coincidence) and here’s a pic comparing the two volumes. Note: the Apollo model is fairly naked: electronics/brace plates need to be added. So the Apollo’s a big machine, and with its size will come all sorts of wonderful problems. Structural for sure… how will the M8 components fair? No doubt reinforcements will ensue. Will NEMA 17’s pull the bed around OK? There will also be a huge test of reliability for the one-shot build, specifically for the software and extruder mechanics. I'll be at events in Albany and Auckland in New Zealand, with even bigger events being held in our Capital, Wellington. So to very briefly summarise, with the use of bearings the wedge attracts a higher proportion of fasteners. I consider this a small price to pay for much smoother running. The volume of RP parts is the same, as is the area of sheet used in the construction, however the number of structural components is significantly reduced. The assembly has been simplified using only a third the number of different bolt types, and the total assembly volume has halved whilst maintaining a similar build volume.